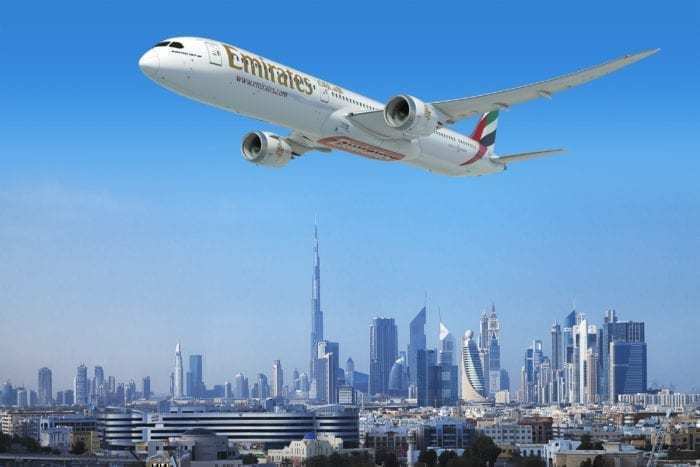 Emirates, perhaps known as the world’s most “blingy” first class airline, is the latest airline to reexamine their fleet and route strategy. This time, however, Boeing seems to be the one in trouble. Quite recently, we wrote about how Airbus was set to receive a huge blow should Emirates switch their order from the A380 to the A350. Now, this doesn’t seem to be a huge blow to Boeing, but one that questions how stable Emirates really is. In 2017, Emirates announced they had ordered 40 Boeing 787-10 Dreamliners scheduled for delivery starting in 2022. For Emirates, the 787 was intended to help maintain a very young fleet through aircraft replacement while others were intended to start new routes. The 787 was expected to hold 240-330 passengers in two and three-class configurations. Believe it or not, this would make the 787-10 the smallest aircraft in terms of passenger capacity in Emirates’ fleet. At the time, the order made sense as Emirates was expanding. The 787-10 was the perfect complement on smaller routes that don’t warrant the 350+ seat capacity on the 777-300ERs and the 480+ seat capacity of the A380s. The 787-10 could also be used to boost capacity on current routes that couldn’t turn a profit with a second, third, or even fourth service from a larger aircraft. Emirates placed the largest single order for aircraft by cost for 150 777X aircraft at $76 billion. 35 were for the smaller 777-8 and 115 were for the larger 777-9. The 777X is the latest generation aircraft succeeding the 777-200 and 777-300 that makes up a significant number of the fleet Emirates operates. Much like their existing A380 order, Emirates is the largest customer for the aircraft type. Emirates is looking to cancel the 40 787-10s on order in favor of 20 777X aircraft. By taking a smaller number of 777Xs, this could create a replacement cycle for the 777-200 and -300s Emirates currently operates. In addition, some 777Xs could be used to replace A380s on routes that are not turning out well for Emirates. Based on this, it would be reasonable to assume Emirates is not looking to aggressively expand like neighboring Qatar Airways. By only flying widebody aircraft, Emirates does significantly reduce the number of routes and destinations to which they can operate. For flyers, this could turn out to be an interesting experience. While Emirates is known for their first class product, their business class product would take an interesting twist. 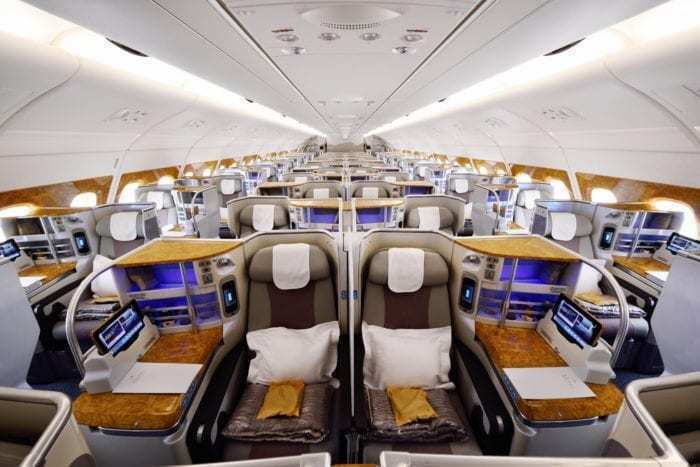 It would have been expected for Emirates to go for a 1-2-1 layout in business class on their 787-10s. The 777X is a wider aircraft and even current 777s on Emirates have a dense configuration of business class seats. Some may be surprised to hear this, but Emirates has middle seats in business class and does not offer direct aisle access! In fact, on the 777s, Emirates operates business class in a 2-3-2 configuration! The same layout can be found on both two and three class 777s. While the cabin has nice finishes, the layout is quite compact and the seat isn’t up to the standards of some neighbors. An ideal configuration on the 777Xs could see Emirates opting for a version of the Apex Suites found on the likes of Japan Airlines, Oman Air, and Korean Air while still maintaining a high capacity configuration. 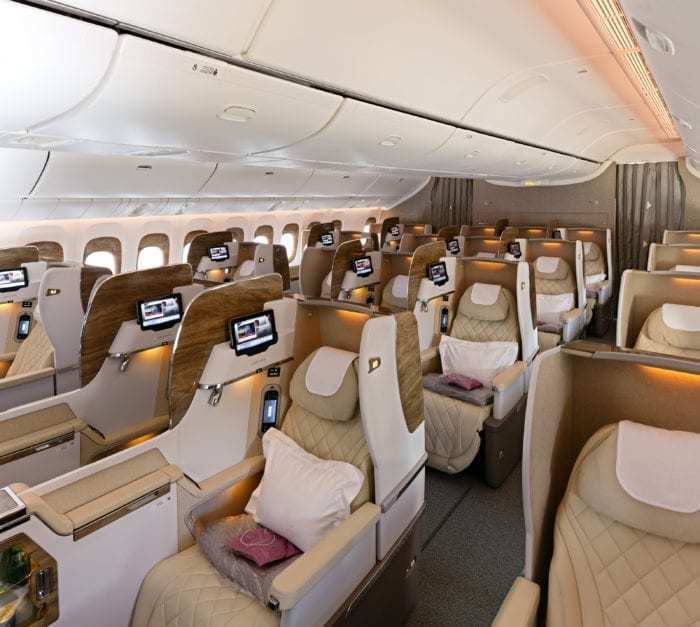 On the A380, Emirates offers a staggered business class in a 1-2-1 configuration. The 787s would have most probably been in a 1-2-1 layout in business class as well since the 787-10 is not as wide as the 777X. Emirates definitely does not see themselves in a position to expand capacity to underserved destinations. That could change, however, depending on how talks with Airbus turn out. Overall, it seems like this could be a turning point for Emirates after extraordinary growth. They could be looking to evaluate a new fleet strategy faced on streamlining pilot training and cabin crew familiarization with aircraft. We’ll keep you posted on how talks with Boeing and Airbus turn out for Emirates. What do you think? Should Emirates cancel their 787 order? Should Emirates order more Airbus or Boeing? Let us know in the comments below! For me, there is more to consider than just the size of the airplane. Also, seems like a lot of people confuse the size airplanes being directly correlating to the comfort that they will have. ie: everyone will assume they will have a more comfortable, luxurious experience in a Cadillac, versus something like a toyota or honda. but when it comes to airplanes, that logic doesn’t apply. i find the larger planes are less desirable as what matters most is how the airline configures and arranges the seats. the distance and pitch of the seats is more important than the overall size of the plane. some of my most comfortable fights have been on 737’s wheras some of the worst are on the large “cattle hauling” planes such as a380’s. in short any plane can be made comfortable to the passenger if the seats are arranged and spaced properly. In addition, i prefer the faster boarding and unboarding process of the smaller planes. Ditto for the luggage. when waiting for them to unload luggage for close to 500 people, seems like i am waiting a lot longer than i would from a less large jet. Another deficit of the really large airplane is if you need to connect to another flight that doesn’t use such a large plane, frequently the large planes can only park at certain gates in the airport and this has caused me to have to run great distances quickly from that type gate to the other gate where the connecting flight will be departing. I hate that. So for me, if i had a choice of a medium size to smaller jet, versus some huge plane with a horde of other people on it, i usually select the flight with the smaller plane. Every airline has its own profit strategy. Emirates should buy the planes that fit Emirates’ strategy. The Dreamliners cannot be beat in low operating costs, but they are the size they are which came from Boeing’s own strategy decision that the demand would be for direct destination flights rather than hub and spoke flights, but not accurately predicting the future is a risk for every company. Neither Airbus nor Boeing will live or die based on Emirates orders. As I understand these things, Emirates would face a substantial monetary penalty for outright cancellation of their A380 order. On the other hand, the A350 has similar (not identical) function/capacity to the 787. So swapping the 787-10 for the 777-9 and the A380 for the A350 may be Emirates’ best bet for avoiding or minimizing penalties while achieving its operational goals. As comfortable a ride as the A380 may be, it is a quad jet…a BIG one. It simply can’t match the operational efficiency of a modern twin jet (be it a 777, 787 or A350). Emirates was/is leaning on Rolls-Royce for more efficient A380 engines, but RR has problems (e.g. Trent 1000, company not profitable). 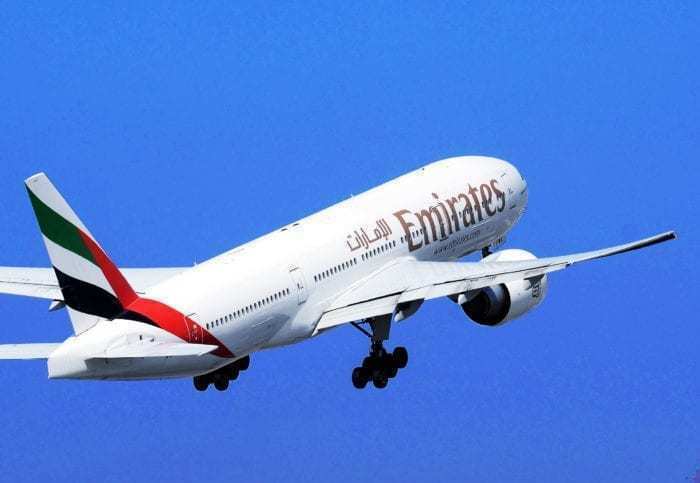 They may not be able to provide a timely solution acceptable to Emirates. If I were a betting man, I would bet on the A380 program ending and for yet more twin jets to grace our skies. 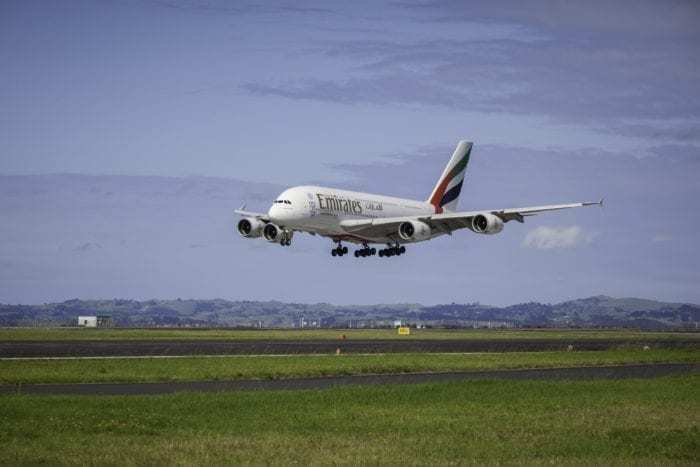 But who knows…maybe something will save the A380. The Boeing 778-9 is known for having very competitive seat mile costs, and the 787-10 provides about 40 more seats than the -9 with the same max takeoff weight at the expense of some range, so it should have the best seat mile costs of any current widebody airliner before the 777-9 is available. Looking at seat configurations between current A350-900 and 787-10 fleets, the -10 generally has more seats in a lighter aircraft, and will do 90% of current routes. It’s hard to see how it can be beaten on cost per seat. The top-notch efficiency of the 787 may be overshadowed in this case by contract penalties for totally bailing on Airbus. I do note, however, the language is that Emirates will “study” the A350 and the A330 neo. I assume there are political considerations as well. It’s hard to believe that one time contract penalties could overshadow the benefits of increased operating efficiency over the life of an aircraft. I wonder whether Emirates is just using this to squeeze Boeing on their price. In the past, Boeing has occasionally eaten the cost of Airbus airline penalties in order to get them to switch suppliers. On the other hand, if true, an Emirates restructuring away from the A380 means the 777-9 will be its designated successor, as it will be the largest remaining airliner available other than the 747-8, which seems essentially dead as a passenger aircraft. I have flown on all these planes (A350 A380 777 787) and my preference by a country mile is the A380. More comfortable and quieter than the rest. I fly Emirates when I have the choice so as to fly this beautiful big bird. I was sorry to hear that airbus will stop making it soon.